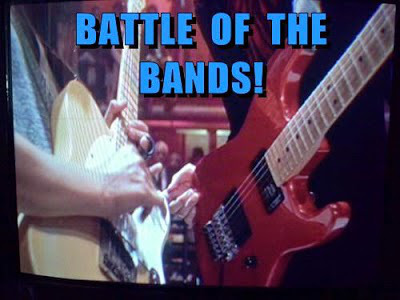 It’s July 15th so not only are we halfway through summer but it’s also time for another Battle of the Bands. This month’s battle features a hit song by Stealers Wheel. Stealers Wheel was a Scottish folk rock/rock band formed in Paisley, Scotland, in 1972 by former school friends Joe Egan and Gerry Rafferty. Their best-known hit is “Stuck in the Middle with You“, a Dylan-esque pop favorite recorded in April, 1974. The band broke up in 1975 and re-formed briefly in 2008. Here’s what Wikipedia says about the song: “Stuck in the Middle with You” (sometimes known as “Stuck in the Middle”) was released on Stealers Wheel’s 1972 eponymous debut album. Gerry Rafferty provided the lead vocals, with Joe Egan singing harmony. Rafferty’s lyrics are a dismissive tale of a music industry cocktail party written and performed as a pastiche of Bob Dylan. (I didn’t know what a pastiche was and had to look it up. In case you’re wondering too, it’s an artistic work in a style that imitates that of another artist). The band was surprised by the single’s chart success. The single sold over one million copies, eventually peaking at number 6 on the US Billboard Hot 100 chart, number 8 in the UK, and number 2 in Canada. The Reservoir Dogs: Original Motion Picture Soundtrack was the first soundtrack for a Quentin Tarantino film and set the structure his later soundtracks would follow. This includes the extensive use of snippets of dialogue from the film. The soundtrack has selections of songs from the 1960s to ’80s. (Only the group Bedlam recorded original songs for the film). Reasoning that the film takes place over a weekend, Tarantino decided to set it to a fictional radio station ‘K-Billy’ (presumably KBLY)’s show “K-Billy’s Super Sounds of the Seventies Weekend”, a themed weekend show of broadcasts of songs from the seventies. The radio station played a prominent role in the film. The DJ for the radio was chosen to be Steven Wright, a comedian known for his deadpan delivery of jokes. Now for my Battle: In searching for covers of this song I found four that I really liked and ironically two of them were by Jazz artists and the other two by Country artists. I couldn’t decide which two to pick, so with a little input from Stephen, I’m going to do my first FOUR-WAY BATTLE in which you’ll place TWO votes: one for your Jazz favorite and one for your Country favorite. Then next month I’ll have the two winners from each genre battle it out for a championship win in August. Hope you guys are okay with this. Jazz Contender #1: Michael Bublé – Micheal Bublé (born September 9, 1975) is a Canadian singer, songwriter, actor and record producer. He has won several awards, including four Grammy Awards and multiple Juno Awards. Bublé’s interest in jazz music began around age five when his family played Bing Crosby’s White Christmas album at Christmastime. Jazz Contender #2: Nicole Henry – Nicole Henry is an American jazz singer. She has performed in the world’s most acclaimed jazz venues, including clubs such as the Tokyo’s famed Cotton Club and Blue Note NYC. She has performed at numerous festivals including the Festival Miami and the San Jose Summer Jazz Fest (2014). Country Contender #1: Keith Urban – Keith Lionel Urban (born 26 October 1967) is a New Zealand born country musician (singer, songwriter, guitarist, TV show judge and record producer) with an impressive award-winning career. Country Contender #2: Juice Newton – Judy Kay “Juice” Newton (born February 18, 1952) is an American pop and country singer, songwriter, and musician. To date, Newton has received five Grammy Award nominations in the Pop and Country Best Female Vocalist categories (winning once in 1983), as well as an ACM Award for Top New Female Artist and two Billboard Female Album Artist of the Year awards (won consecutively). Juice Newton did this cover of Stuck in the Middle with You in 1985 on her tenth studio album Old Flame (released in November 1985). Old Flame was recorded after Newton signed a new recording contract with RCA. It peaked at number fifteen on the Billboard album chart. In his review of the album music critic Thom Owens notes that “out of all of Juice Newton’s albums, Old Flame has the strongest country roots and influences”. Featured on the album were cover versions of Del Shannon’s “Cheap Love”, Roy Hamilton’s “Hurt”, The Byrds’s “Feel a Whole Lot Better” and Stealers Wheel’s “Stuck in the Middle with You”. This entry was posted in Stories and tagged Battle of the Bands, BOTB, Juice Newton, Keith Urban, Michael Buble, music, Nicole Henry, Stealers Wheel, Stuck in the Middle with You by greyzoned/angelsbark. Bookmark the permalink. “Stuck In The Middle” reminds “Mama Told Me (Not to Come),” the Randy Newman song recorded successfully by Three Dog Night. To my ears, and to give you a preview of how my votes are going to go, “Stuck In The Middle” works best when performed by a male singer. I also believe the song is a better fit when given a country style arrangement. By a process of elimination in your four-way battle, therefore, I am giving my vote to Micheal Bublé in the jazz category and to Keith Urban and The Ranch in the country category. Nicole Henry sings with soulful passion, but I do not think that style fits this particular song. Juice Newton’s rendition came across sounding a bit like a karaoke performance, in my opinion. However, I admit that I almost always prefer studio recorded material to live performances and that automatically put Nicole and Juice at a disadvantage in this contest. If Keith Urban makes it to the finals he will get my vote as grand champion because I liked his version best. It stays close to the original and the original is sublime. Thanks for the early morning entertainment, dear friend Michele, and enjoy your weekend! Good morning Tom. Thanks for stopping by so early with your votes. Why does Stuck in the Middle with You remind you of Mama Told Me Not to Come? Hi again, dearie! The one reminds me of the other because, in both songs, the storyteller finds himself in a strange, awkward and embarrassing social setting. Oh, okay. Makes sense. Thanks for getting back to me. What do you think of the Stealers Wheel video? Did you watch it? Yessum, I watched the video. It is very entertaining – filled with bizarre characters – and open to various interpretations. Are you taking Luca to the Psychic Fair? You challenged my little travel notebook computer with this four way, but I managed. My preferences here are Buble for the jazz and Keith Urban for the country version. Got it. Thanks. Safe travels. Listening to all these back to back really solidified my vote. Love Michael Buble; always have. His smooth vocals and musicianship deliver and most of the time, he would get my vote. However…. Keith Urban….YAAASSSS! Take that song and own it, brother. He country-fied that tune in a very satisfying way. KEITH GETS THE VOTE. Don’t forget to visit the Flipside – I’m baaack. Hey Cherdo! Welcome Back!! Good to see you here. Okay I just want to clarify: you were supposed to vote for one artist from each category, one jazz and one country. I got your vote for Keith Urban. And from your comment I’m assuming that your vote for the jazz group would be Michael Buble, right? Just wanted to double check. I’m having trouble with the jazz versions. I don’t really like either but I agree with Tom that it sounds better sung by a man, so give my vote to Michael Buble. Keith Urban definitely for the country style. It sounds closest to the original. Good way to present your own difficult decision! I love Reservoir Dogs and especially love the scene that uses Stuck In The Middle With You. It really is the perfect song for that sequence. For the jazz version, I vote for Nicole Henry. I like her smoky, bluesy voice. The country version is harder for me. I vote for Keith Urban, simply because I like his voice a little better. Hi Janie. Happy Saturday! Thanks for voting for Nicole Henry… it’s her first vote. And I have you down for Keith Urban. I’ll begin by saying I have always loved this song, and I wish I had a dollar for every time I’ve used that line about “Clowns” and “Jokers”. I’m a huge Bob Dylan fan but I had never thought of this song as being Dylanesque, however, now that you mention it, sure it is! That line about Clowns and Jokers is right out of the Dylan playbook. I thought every single recording here was good, but when you start with such a terrific song you’d almost have to consciously work at it to mess it up. I was planning to, and very nearly did, use a Michael Buble recording in this round of BOTB. But then a few days ago something happened which caused me to change songs and artists and switch to what I have used. But now I’m thinking I’ll go back to that Michael Buble recording for my next Battle in August. Speaking of MICHAEL BUBLE — Hokey-Smoke & Hoo-Wee! His recording of this song is incredible! Absolutely fantastic!! Like, as in, “Blew-Me-Away Fantastic!” Every single thing about it was perfect. And his voice — WOW! I think I may have to find out what album that recording is on and buy it. Thanks for turning me onto that. I like what little I’ve heard of Buble, but this — THIS! — …I just had no idea. Now the Country category was super tough on me. I’ve listened to both of them twice and I’m still not sure how to vote. I totally dig them both. And I generally prefer male vocalists to female singers, but this one is really close. Hold on. I’m going to listen to both of them a third time and then try to make up my mind….. Damn! Both of them are really, REALLY good! Now I understand why you were having such a difficult time in contemplating this Battle. I could vote for either one of them. And that being so, I’ll give my vote to JUICE NEWTON because she hasn’t received one yet and by no means does she deserve to be shutout here. Hiya Stephen! Thanks for taking so much time in contemplating your votes. And I’m so happy that at the very least Juice will have a vote. Thanks for that. Glad you liked my selections. I’ll look forward to checks ng out your Buble song next month! Whew! Brilliant idea for a battle, Michele! I’ve always liked this song. It’s been a long day (had to work today) so will keep this short and simple. For the Country version – My vote is for Juice Newton. There you have it! Looking forward to the outcome for next month’s battle! Hi Michele; Interesting concept you have going here! 🙂 Quentin Tarantino has the greatest soundtracks, doesn’t he? I’ve always liked this song and enjoyed all the cover versions. Keith Urban absolutely NAILED it! He gets the country vote. For the jazz vote, it’s Michael Bublé, without hesitation. I’m voting for both women because in both cases I like the arrangement better. Michael Buble doesn’t seem to be able or willing to tone it down from full big-band “Vegas, baby!” and this isn’t the first time I’ve had that complaint about his arrangement. Nicole Henry’s arrangement is more appropriate for the song and for the venue (I think this was recorded live in a nightclub…?). I liked both Keith Urban’s and Juice Newton’s arrangement almost equally, but it was the piano at the beginning of Juice’s that sold me. Hi Michele, great song choice. I’m going to have to go for the two men, Buble for jazz and the gorgeous Keith Urban for the country version. If I could only choose one it would be Keith Urban every time. Thanks for your votes. Gotcha down for Michael and Keith.